The #metoo movement gets one of its first stage plays. Get ready for more. 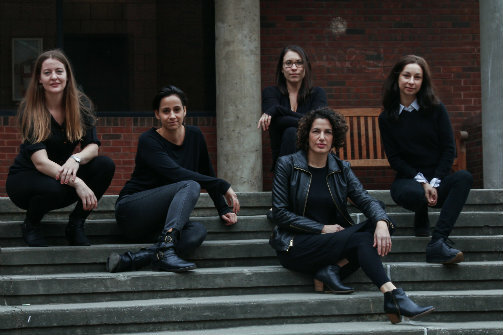 The team behind Artemisia's Intent. Photo by Amrita Li Newton. BOTTOM LINE: A solid, timely piece about Artemisia Gentileschi and the women who follow her. It's hard to say how long The Anthropologists have had this one-person show in development, though they’ve certainly chosen the right time to present it. Think of this as a classic “I-was-wronged-and-now-I’m-here-to-tell-you-the-real-truth” solo show as told by early seventeenth-century painter Artemisia Gentileschi, combined with a collage of found text from the #metoo movement. Artemisia, played commandingly by a relatable Mariah Freda, is a lesser-known painter of her era, perhaps precisely because of that pronoun. We’re told that she is one of the many female painters whose work is kept in storage at the major museums of the world. She offers us a list of items of how to get ahead in this world as a female-identified artist. Certainly the tip to “negotiate your rate” is sound advice in any industry with deliberate parallels with the contemporary gender wage gap. It’s her darkest trauma that hits hardest and cannot escape a contemporary comparison. Freda finds the right tone here guided with precision by director Melissa Moschitto. Through a succession of layers of fabric removed from her dress and the scenery, Freda unveils the harsh truth of Gentileschi’s life. Notably absent are her paintings themselves. We’re left to fill in these masterpieces (or Google them later). While an empty frame hangs center, through Freda’s baroque poses we understand their often grotesque beauty. In the most loving sense, UNDER St. Marks is one of the vestiges of theater dumps in New York City. How the roof still stands in this basement venue, or how bad the roach problem must be, is better left to the imagination. Moschitto and her team of collaborators—Freda, Irina Kuraeva, Brianna Kalisch, and Lynde Rosario—present a neatly tailored production that is no match for this sub-par space. Adrian Bridges' sound design is elegant and streamlined. My initial cringe at the rather on-the-nose intoning of Kesha’s "Praying" at the start aside, Artemisia’s Intent is a solid, timely piece to check out at this year’s Frigid Festival. Artemisia's Intent is devised by Mariah Freda, Irina Kuraeva, Brianna Kalisch, Melissa Moschitto, and Lynde Rosario and written and directed by Melissa Moschitto. Visual Design by Irina Kuraeva. Lighting Design by Wren Mitchell. Sound Design by Adrian Bridges. Stage Manager is Mary Daniel. The cast is Mariah Freda.